At our Santa Fe family dental practice, our team works hard to help protect the oral health of all of our patients. One of the biggest threats our patients face to enjoying a great looking smile for a lifetime is severe gum disease, or periodontitis. A chronic infection, periodontitis attacks the gum tissue and underlying bone structure that holds our teeth into position. When these structures are damaged, our teeth become loose and can eventually fall out. Periodontitis ranks as the leading cause of permanent tooth loss in U.S. adults. Much like when treating any type of infection, antibiotics are typically used to kill the harmful bacteria that causes gum disease. Unfortunately, an over-reliance on the use of antibiotics have made many types of bacteria largely immune to the drug’s effects. However, a new antibiotic being developed at the University of Virginia School of Medicine appears to have a lot of promise when it comes to fighting gum disease, according to researchers. The results of this study has us excited at our Santa Fe family dental practice, and was published in the Journal of Periodontology. The drug, called amixicile, was found effective in fighting the type of anaerobic bacteria linked to periodontitis. Researchers have already been testing amixicile’s ability to treat and prevent a dangerous bacteria that can cause life-threatening infections, and now believe the drug could become a perfect treatment option to help patients combat gum disease. Researchers suggest that amixicile may also possess another important benefit. Because the drug work differently than other types of antibiotics, researchers believe that it will be extremely difficult for bacteria to develop a resistant to amixicile. That means the drug could be widely used without contributing to the growing problems of antibiotic resistance. While the new drug could have many different applications, it appears to have several specific benefits when it comes to treating gum disease. The researchers at VCU found that amixicile was highly effective at preventing the growth of six different species of harmful bacterium directly linked with the development of gum infections. Additionally, amixicile was found to reduce the bacteria’s ability to penetrate gum tissue and cause inflammation to develop, key steps in establishing an infection of gum tissue. Data collected by the research team also suggests that the drug accumulates in inflamed gum tissue where harmful oral bacteria tend to buildup, a feature that may help to prevent amixicile from destroying the healthy bacteria that normally surrounds gum tissue. Researchers are very excited about the potential shown early on by amixicile. “The bacteria most responsible for the development of periodontal disease are a diverse group. The ability for amixicile to effectively target these bacteria is a significant step forward that will provide a new and targeted treatment approach for gum disease. The need to discover more antibiotics that can directly target specific types of bacteria is incredibly important,” noted researchers. You don’t need to be the best dentist in Edmond to know that keeping your teeth looking and feeling their best means needing to brush and floss daily. Of course, while we’ve all been told since childhood that brushing and flossing play an important role in determining how healthy our smiles, a little more confusion surrounds whether we should brush or floss first. Fortunately, researchers have come to our rescue to finally answer this age old question. 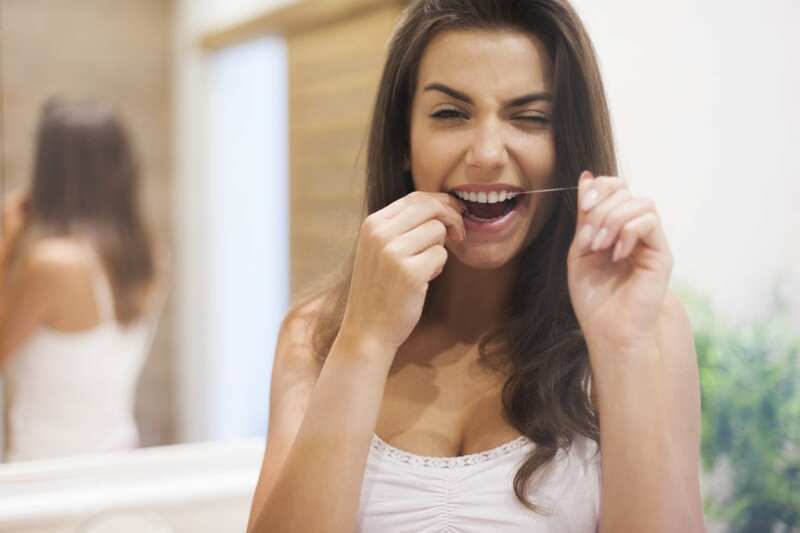 The results of a recent study found that flossing before brushing may actually be the ideal sequencing for removing the most buildup of dental plaque. The results of this latest study was recently published in the Journal of Periodontology. In the study, titled “The Effect of Toothbrushing and Flossing Sequence on Interdental Plaque Reduction and Fluoride Retention,” researchers examined 25 participants who were instructed to brush before using floss to clean between their teeth. In a second stage of the study, the same group was asked to us floss before brushing. Researchers discovered that the amount of plaque between the teeth and in the mouth overall was significantly decreased when participants used the floss/brush sequence. To explain the results, researchers concluded that since flossing helps to loosen bacteria and food debris from between the teeth, brushing after flossing helps to further remove these types of substances from the mouth. Plaque and other harmful oral bacteria are the primary cause behind the development of gum disease, a chronic infection that develops when bacteria are allowed to buildup below the gum line. Gum disease can cause swelling, inflammation and the irritation of gum tissue. When gum disease goes untreated and is allowed to progress, it can cause permanent tooth loss. Researchers also discovered that fluoride, a natural occurring mineral that’s commonly added to toothpaste and even the public water supply of many communities throughout the U.S. that helps to prevent tooth decay, remained in the mouth for an extended period of time when patients flossed prior to brushing. Participants in the study brushed with a fluoridated toothpaste during both stages. Brush twice a day. The American Dental Association recommends brushing at least twice a day – once in the morning after breakfast and again at night before bed. However, depending the current state of your oral health, you may need to brush more frequently to maintain your oral health. Brush for at least two minutes. The ADA also recommends brushing for at least two minutes each time you brush. Our mouths feature a lot of hard to reach areas that require time and attention to properly clean. Two minutes provide enough time for you to properly clean all areas of the mouth, including both the front and back of your teeth. Unfortunately, studies have found that the average adult only brushes for about one minute a day. That’s just a quarter of the amount of time recommended by the ADA. Floss at least once a day. Finally, the ADA recommends flossing at least once a day, ideally at night before bed. While flossing may seem unnecessary, the habit enables you to remove food and bacteria from areas of the mouth a toothbrush cannot reach – between your teeth and below the gum line. (Bonus) Rinse with mouthwash. While not part of the ADA’s guidelines for quality oral hygiene, you could add a non-alcoholic mouthwash as part of your daily routine. If you decide to use an oral rinse, make sure to use a brand that doesn’t contain alcohol, as that could lead to drying out your mouth. Also, make sure to only use the mouthwash as directed as overusing the product could have unintended consequences. If you have any questions about the best ways to brush or floss, make sure to ask any member of our team during your next visit to Santa Fe Dental. 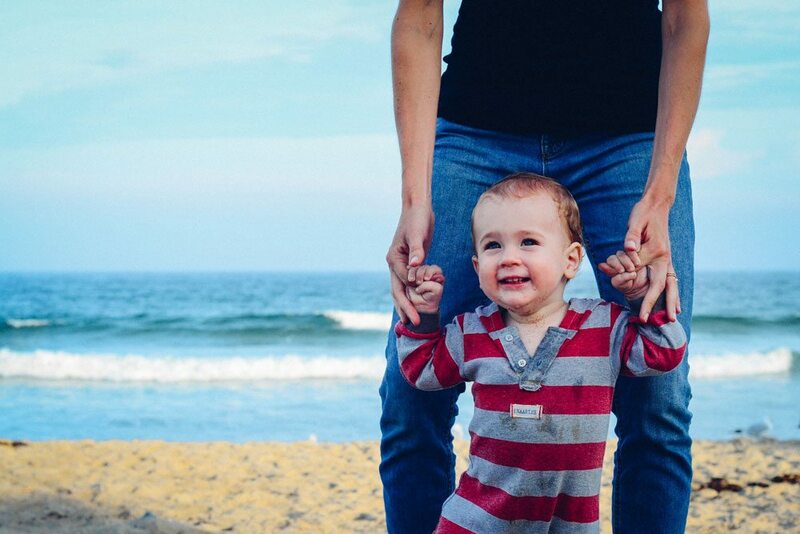 As babies turn into walking and talking toddlers, there are important oral health concerns to remember to keep your little one’s teeth healthy and happy. The experts at the American Academy of Pediatrics and the American Academy of Pediatric Dentistry both recommend that children should see the dentist by the time they are one year old, and to continue on with regular dental check ups as they grow. Making sure to make time to visit the dentist during your child’s first few years can also end up saving you money and hassle. The Center for Disease Control came out with a report saying that average dental care costs were 40% lower over a five year period for children who received dental checkups by age one versus those who did not. Edmond, Oklahoma dentists Drs. Mark Allen and Michael Hansen have the following oral health tips in for you to keep in mind for young children. Taking care to not allow toddlers to constantly drink sugary drinks, like juice and soda, is key to avoiding early teeth problems. The slow sucking of sweet and acidic drinks through bottles or sippy cups is terrible for the teeth enamel and can encourage bacterial growth. Though you may have heard of “baby bottle decay” before, many parents are unaware that putting a child to sleep with a bottle of milk, juice, or formula can allow sugars to adhere to the teeth and the resulting bacteria can cause decay and cavities. Untreated cavities and decay can even lead to more serious dental diseases that could even affect growth, and learning capabilities. Binkies or pacifiers are often great tools to help babies and toddlers fall asleep or deal with stress. Pacifiers have even been suggested by the American Academy of Pediatrics to help prevent SIDS (Sudden Infant Death Syndrome) during the first year. But most health care professionals are in agreement that long term pacifier use can be bad for kids’ oral and dental health. It can detrimentally affect how the bites and teeth line up, and can lead to under bites, over bites. or cross bites. It’s best to limit the use of pacifiers to prevent it affecting the mouth shape, perhaps removing it after a child goes to sleep. Exposing your child to the dentist at an early age not only allows them to check your toddlers’ oral health, but also helps the child become more confortable and confident with the dentist office experience. As for parents, visits can also raise their oral health knowledge and let them know more about fluoride, oral hygiene, and correct teeth development. By creating early positive understanding and familiarly with a dentist, it can help set your child up for dental success for their entire life. Starting your young children on brushing early is one of the best ways to ensure a lifetime of healthy teeth. As soon as your baby has one tooth you should begin to brush it. Using fluoridate toothpaste is also recommended to help strengthen teeth, along with making sure to use soft bristled toothbrush for their little teeth. Your dentist will be happy to show your children the proper way to brush their teeth on your next visit. Many parents are not aware that their kids actually need their help until age six with teeth brushing, as a child’s manual dexterity simply is not refined enough to get all the teeth brushed properly. If you have any questions about dental care of kids and toddlers, the staff and dentists in Edmond, Oklahoma at Santa Fe Dental are happy to answer them. At our family dentistry in Edmond, Oklahoma, our team at Santa Fe Dental will always happily inform patients about the need to brush and floss daily. For many patients, their daily oral hygiene routine also includes the use of a mouthwash as just one more step towards enjoying the freshest, healthiest smile possible. While mouthwash may seem like an innocuous part of any oral hygiene routine, a new study is now raising question of whether regularly using mouthwash may increase the risk for the development of type 2 diabetes in individuals already at a high risk for the disease. Published in the journal Nitric Oxide, the study discovered that individuals who use mouthwash at least twice a day had a 55 percent higher risk of developing prediabetes or diabetes over a three-year follow-up period when compared to participants who used mouthwash less frequently. Among the study participants who used mouthwash at least twice a day, 30 percent either developed diabetes or prediabetes, a condition where blood sugar levels are higher than normal but not yet in the range for diabetes. 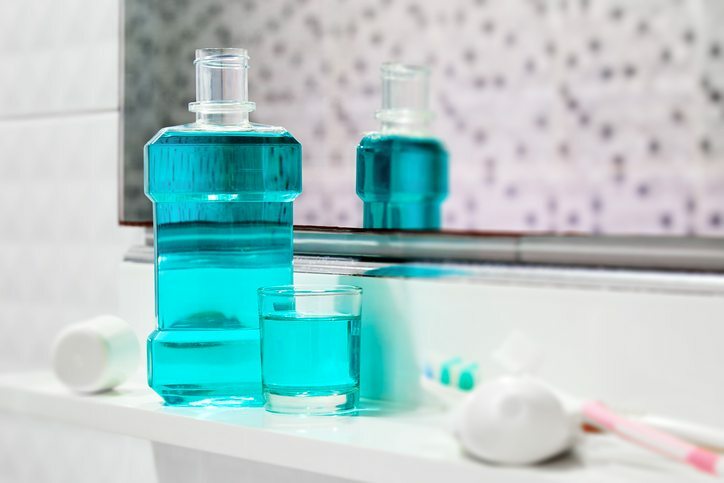 Over-the-counter mouthwash brands – especially those with alcohol – contain compounds that eliminate both good and bad types of oral bacteria from the mouth that contribute to the development of plaque buildup and bad breath. Unfortunately, some of the helpful oral bacteria that mouthwashes eliminate also product a chemical – nitric oxide – that helps to prevent diabetes. 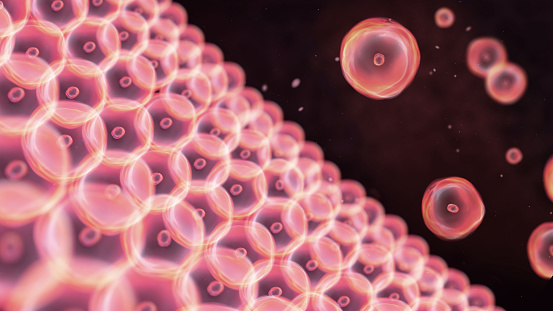 Nitric oxide actually plays a vital role in the regulation of insulin levels in the body, which has a large effect on our metabolic rates and energy levels. When this “good” bacteria are repeatedly destroyed by frequent mouthwash use, a change occurs to the oral microbiome that alters how are body is able to metabolize blood sugar in the body, leading to the development of diabetes or prediabetes. As part of the study, researchers examined over 1,200 overweight individuals between the ages of 40 to 65 who did not have diabetes or any known history of coronary artery disease. Researchers had complete data available on nearly 950 of the study participants. This study was part of the larger San Juan Overweight Longitudinal Study that was conducted in Puerto Rico. Researchers discovered that 43 percent of those involved in the study used mouthwash at least once a day, and 22 percent used it at least twice a day. While both of these subgroups within the study were at a higher risk for developing diabetes or prediabetes, there was no association seen when mouthwash was used less than twice a day. Researchers believe that a threshold effect exists, so when the product is used more than twice a day it increases the risk for diabetes. 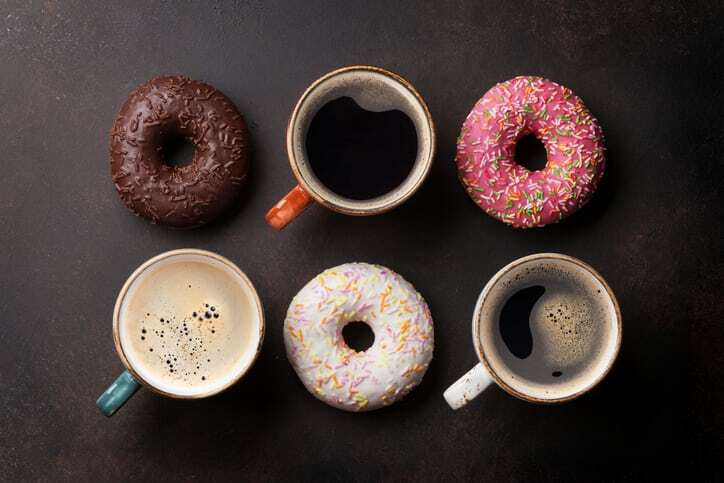 Researchers found this association held even when they adjusted for known risk factors for diabetes, such as income level, education, sleep breathing disorders, oral hygiene habits, diet, and obesity. Researchers cautioned that while the results of their study found an association between frequent mouthwash use and the risk for diabetes, no cause and effect relationship was established. In a previous blog post, we discussed which types of mouthwash to avoid and which to use. However, based on this latest study, it might be a good idea to limit your mouthwash use to just once a day, especially if overweight or have a family history of diabetes. While rinsing with a mouthwash after brushing certainly adds some benefit when protecting your oral health, you can skip this step if you schedule regular visits to our family dentistry in Edmond, Oklahoma. Regular exams and cleanings provide our staff the chance to spot the signs of dental decay and disease early on before any lasting issues can develop. So while it’s commendable to take your oral hygiene seriously, too much mouthwash could cause more problems than it prevents.